ALL INCLUDED! Just love it and and live it. 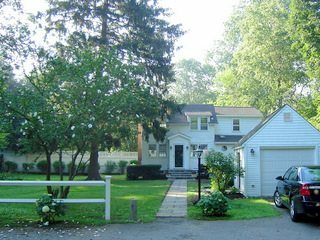 Welcome to Storybrook Cottage, a charming home conveniently located near the Westport downtown village, on a private cul-de-sac next to a meandering brook. Walk, bike or drive to all that Westport has to offer. Compo Beach permit included. All utilities are included, so this completely furnished cottage makes the perfect retreat and/or get-a-way. Light a fire, invite friends, and entertain the same day you move in. You only need to pack your bags! Private deck perfect for enjoying the ducks and birds that also make Storybook their home. Short- and long-term rentals available.